The Pullman Marseille Provence Airport hotel is 3 minutes from the airport and 10 minutes from the Aix-en-Provence TGV train station. 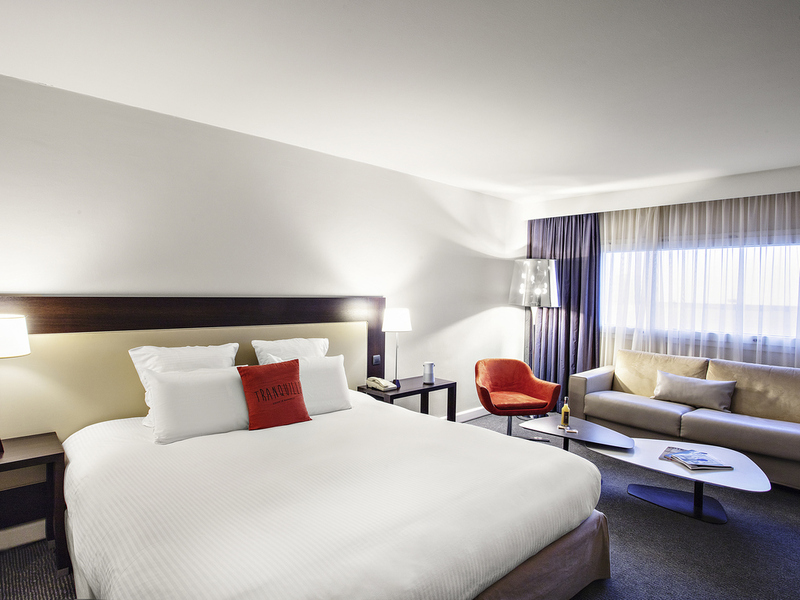 The spacious, air-conditioned rooms are perfect for relaxing in. The fully-equipped, modular meeting facilities can accom modate up to 250 guests. WIFI is available free of charge in all areas. The 4-star hotel has a bright restaurant-lounge bar with terraces. It is easy to reach with the 24-hr airport shuttle service, or you can park in the free enclosed car park. The Pullman Marseille Provence Aéroport hotel is less than 10 minutes from Airbus Helicopters and Helisim, with a free 24-hour shuttle service. It is also easy to get to Marseilles, its Euromed business district, Aix-en-Provence and CEA-Cadarache. The Pullman hotel is ideally located for visiting Provence: MuCEM, Luberón and Camargue are all less than an hour away by car. The hotel is perfect for exploring the region alone, as a couple or with family. 25 min from Stade Vélodrome de Marseille. The hotel offers four levels of comfort: Classic, Superior, Deluxe and Suite. In the Deluxe Room, enjoy the zen-like decor with a king-size bed and sofa. The "Savane" Suite offers 807 sq. ft. (75 m²) for you to enjoy a luxury stay. The restaurant bar, D.LLIS has a lounge atmosphere and is ideally located in the heart of a leafy park. Its two terraces are perfect for totally unwinding. The restaurant serves high quality Mediterranean cuisine which can be tailored to your tastes. Our new lounge bar and restaurant, D.llis, offers various areas indoors and out where you can enjoy a cocktail or a glass of wine from the wine bar. Try something from the snack menu avaiable from 11 a.m. right through to 1 a.m.
Room was fine. However, when I got out of the shower, I found that there were no bath towels. Also the tissue box had only a few tissues in it. I needed more. Walking distance from the hotel. Good service. Good breakfast. Clean room and quiet. Walking distance from the terminal but you can call the shuttle for a pickup. Shuttle is available to return you to the terminal. Lots of parking spaces. Stayed there multiple times and I will return when needed. Excellent hotel for airport overnight stay. Enjoyed the breakfast and pleasant staff experience. Very courteous and professional treatment. A green spot where you can feel home at airport! The staff is always kind, helpful and clear. The room is spacious and well set (pillow etc..) and quiet. The most amazing part is the fact that you have a nice terrace, with greenery and the breakfast is absolutely fabulous! Each and every ingredients is of top quality. All formyou to start well the day. The room was quite hot. The AC would not cool the room. The pillows were not comfortable at all. One pillow was too big to use and the other was very hard. For an airport hotel I was incredibly surprised at how professional and well run this property is. Great check-in, fantastic food, comfortable room, clean bathroom (surprisingly hard in today's world to achieve) and very friendly bi-lingual staff. A good stopover before catching a flight. Navette to and from airport very efficient. Great ambience for an airport hotel with grounds and nearby nature reserve. A pity that the air-conditioning in the hotel was switched off. Although it was March the room was hot at night . The sun shines in Marseille in the spring! Staff was very very nice, breakfast was great and facilities wer quite good (nice gym but the swimming pool is only outside, so it can only be used in Summer). The real problem come from a very 'old-fashioned' kind of room, that badly needs renovations. No air conditioning on a hot March day in South of France with the large room window (probably) facing South is hardly acceptable in a hotel of that standard ( I was told by the staff that air conditioning is only centralized and cannot be activated if the system is still set to Winter): this is surely something that needs to be fixed. I also disliked the old fashioned shower and the fact that the curtains of the large window could not be closed (might have been me not managing the mechanism properly, but I don't think so). TV was very good but not up to best standard (nowadays it's quite common to find smart-TV that can mirror screen from cell-phone or tablet, while this couldn't). Satisfied but could be even better if I found shop to have some drink and snack. Can I get some points by this stay? My account No. 30…8868. The bed was confortable, the shuttles from/to the airport and from/to Airbus Helicopters facilitires were a great detail and the breakfast was also really good. To point out something negative, the rooms are quite old-fashioned. The staff is really nice. The room is far away too old with a clear lack of comfort in the atmosphere (air cond). I had an early morning flight and decided to check-in and stay the night before. The hotel iis in a park like setting and the main floor is stylish. I was very pleasantly surprised by the quality of the restaurant, which is well above my expectations for a hotel restaurant. The welcome by staff in the hotel was welcome, the room comfortable and well appointed, and the shuttle at 5:30 a.m.much appreciated!